You have 2 ways to save money at dressbarn stores in the U.S. or online. 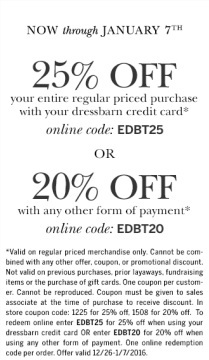 First one: take 25% off your entire purchase when you use your dressbarn credit card (online use promo code EDBT25). Second one: take 20% off your entire purchase with any other form of payment (online use promo code EDBT20). To receive the offer in-store print a special sale coupon (available online). Source of the information is dressbarn. Offer expires 01/07/2016. More details available at stores.